Hillary Clinton shouldn’t abandon the Obama administration’s cautious approach to foreign policymaking. Former U.S. secretary of state and likely 2016 U.S. presidential aspirant Hillary Clinton took aim at incumbent U.S. President Barack Obama’s foreign policy in a recent interview with The Atlantic‘s Jeffrey Goldberg. 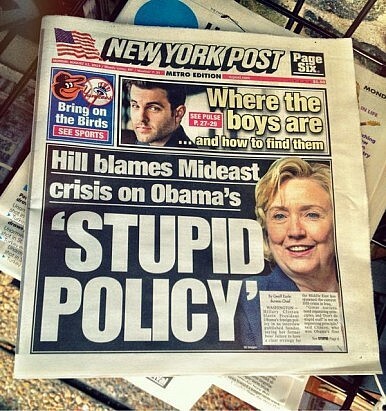 Of Obama’s failures she says: “Great nations need organizing principles, and ‘Don’t do stupid stuff’ is not an organizing principle.” To be sure, Clinton is a knowledgeable stateswoman, skilled diplomat, and keen analyst of global affairs and has much to take credit for as the United States’ top diplomat for most of Obama’s presidential term so far. However, her dismissal of Obama’s look-before-you-leap brand of foreign policy is dangerous and certainly a view worth reconsidering ahead of a 2016 presidential campaign. When it comes to American foreign policy, not doing stupid stuff is perhaps much harder than it looks. Making this argument in August 2014, as the Middle East burns and Ukraine teeters on the verge of schism, is tough, but the facts are that most of the critiques being levied against U.S. policy in places like Syria and Iraq are based on a brand of intellectually unsound counterfactual reasoning. As we witness the atrocities being committed by the Islamic State (IS) in Iraq, it is easy to imagine what could have been had the United States listened to calls to intervene in Syria late in the summer of 2012, when a moderate Syrian opposition was somewhat perceptible amidst the Levantine rubble. In the end, the administration assessed its options in Syria and chose the least inflammatory route for U.S. policy by some accounts. In the eyes of the administration, rushing to provide lethal aid, setting up “safe zones,” or conducting air strikes against al-Assad’s forces were precisely the sort of options that could very easily have led to a slippery slope of “doing stupid stuff.” The trajectory of U.S. policy in the past three years in the Middle East might not have been the best possible one, but given the information that was available at the time, it was arguably the most responsible approach. Present events in the Middle East can be explained in many ways, but regardless of the causes of chaos there, the administration’s cautious approach has served the American national interest (albeit imperfectly). What is perhaps a more important takeaway from the Obama administration’s doctrine of “not doing stupid stuff” for a budding 2016 presidential candidate is that it demonstrates an acknowledgment of the hard-to-swallow fact that America does not choose its wars anymore. It continues to be caught off-guard by black swans–the Arab Spring and Russian irredentism being two of the more recent examples. In her interview with Goldberg, Clinton is committed to a Ronald Reagan-esque understanding of the U.S. place in the world as the shining “city on the hill,” capable of exhibiting leadership, initiative, and agency in solving the world’s crises. This is far from true today, and acknowledging it does not necessitate abandoning the idea that American power can continue to do good in the world. I think he was trying to communicate to the American people that he’s not going to do something crazy. I’ve sat in too many rooms with the president. He’s thoughtful, he’s incredibly smart, and able to analyze a lot of different factors that are all moving at the same time. I think he is cautious because he knows what he inherited, both the two wars and the economic front, and he has expended a lot of capital and energy trying to pull us out of the hole we’re in. So I think that that’s a political message. It’s not his worldview, if that makes sense to you. “Not doing stupid stuff,” ultimately, is the kind of technocratic and cautious approach to American foreign policy that was necessary after the Bush years. It’s also a swing towards greater realism in foreign policy. Clinton’s critique, in the end, is about the outcomes of U.S. foreign policy in recent years which, admittedly, don’t look too great (as others have noticed). Regardless, the general principle underlying the current administration’s approach to foreign policy-making is worth not casting aside. The United States continues to be supremely powerful and could very easily fall into the schema of man-with-hammer-sees-everything-as-nail. Instead, it must approach the world with almost academic caution. Even if Hillary Clinton doesn’t retain “not doing stupid stuff” as the “organizing principle” of her foreign policy, she would do well to recognize the limits of American power and agency on the international stage. Can Kerry change Putin’s mind on Syria or Iran? The Diplomat presents its preview for the upcoming week.